A rather surprising discovery in still young 2013 are the GENIUS boxes by Italian electronic company MIMO. One of the boxes was first brought to my attention my a fellow member on the shmups.com board. He found a relabeled version of the Genius 1 box listed at Australian (!) reseller converters.tv. After a few minutes of googling, I contacted MIMO in Italy to get ahold of two review units - - and here we go. The most interesting fact about both the Genius Box 1 and 2 is that they're no simple upscalers, but cross-converters with both up- and downscaling capabilites. The original Genius box offers a 6-pin RGB input and output as well as a HD15-style VGA input and output connector. The converter accepts 15khz RGB/CGA (240p and 480i), 24khz (384p) and VGA (480p) and converts every single one of these resolution into each other. CGA to VGA would be the most common situation, but the other way around (VGA to CGA) is especially interesting, since both the Extron Emotia and the Ultracade UVC are so hard to find nowadays. The Genius 2 box adds a composite video input and, a HDMI output and higher upscaling resolution (e.g. 720p, 1080i and 768p). RGB and VGA connections are still available on the input and on the output side (HDMI downscaling isn't supported though). 50Hz output is not supported. 50Hz sources will be converted to 60Hz (on the Genius 2 at least). Current retail prices (directly at MIMO) are 220 Euro for the Genius 1 and 250 Euro for the Genius 2. Both boxes are built with a heavy-duty steel chassis and are obviously meant for industry applications and nonstop use in commercial arcade environments. 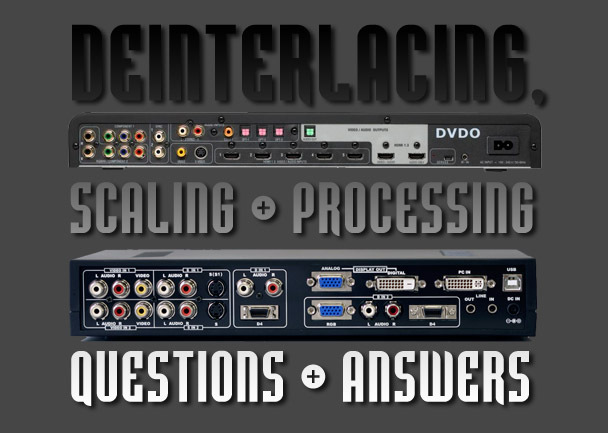 This review here will focus on the upscaling capabilities of both converters first and downscaling in the second half . If your focus is on downscaling, read on here, but make sure to check my Scanlines Demystified page as well, so see in detail how both the Genius boxes compare to the classics (Extron Emotia series and Ultracade UVC). (I'll try to update the page in early march). 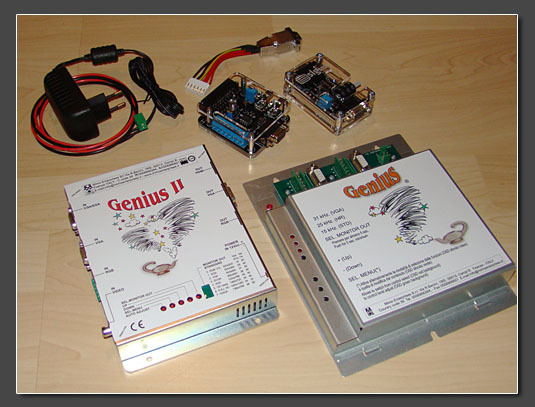 Obviously both versions of the Genius boxes are built for commercial applications and that's something you'll notice in the connections as well. Compared to many other upscalers here on my page, the MIMO boxes are certainly not what you would call plug'n'play. In order to get any of them working you require a bunch of additional material. This starts with a PSU (12V, less than 1A) with a custom output cabling. You also require a so called AMP Modu-1 connector for your RGB sources (or for the RGB output if you want to use the Genius boxes as downscalers). Modu-1 is basically just a straight line of 6 pins, similar to the output of the Ultracade UVC, but not exactly the same. For the purpose of this review I quickly soldered a Modu-1 to HD15 adapter which gives me access to my usual cabling. For the RGB input you might also require a sync cleaner (depending on which systems you want to use as a source). To avoid any trouble I chose the Arcadeforce Sync Strike for this purpose (Scart RGB source > Sync Strike > VGA to Modu-1 adapter cable > Genius Box). On the VGA output I added a SLG3000 - just for fun of course. If you don't want or need scanlines, leave it away. With all that gear in place, we're ready to start! On the Genius 1 I had a *very* hard time to get a picture from my RGB sources. Please keep in mind that I don't have any arcade RGB sources around and can only test RGB with consumer levels (0.7V peak level on home equipment vs. 2V+ on arcade machines). I ran my RGB sources through a sync cleaner without any success. I then added a number of RGB interfaces between the Sync Strike and the Genius. Again no success with a Kramer sync converter and no success either with an Extron RGB 203rxi. Finally I tried an Extron RGB 190 and got a picture using the C-Sync output wired to the H-Sync input on the Genius's side. Seperate sync signals (H+V) didn't give a stable picture, although the Genius' CGA input is labeled RGBHV. The picture I got at first looked very weird (see small picture below on the left). After adjusting the contrast level down to about 50%, the colors looked right (bigger picture on the right). Linedoubling quality on 240p sources is very nice. No deinterlacing is applied and the results are easily on a level of the earlier XRGB linedoublers. The Genius' auto adjust function is a problem though. Again the unit is meant for nonstop usage with a single source. If you switch sources you'll need to re-adjust the geometry settings and this can get nerve-wrecking. And even with a lot of adjusting I wasn't able to get rid of an irritating and visible instability on the vertical axis - similar to what I'm used to from the early XRGB machines. It's a clear sign that the original Genius box was geared for use on CRTs and not on digital setups ending in a LCD or plasma setup. The SLG3000 works nicely on the Genius' output. 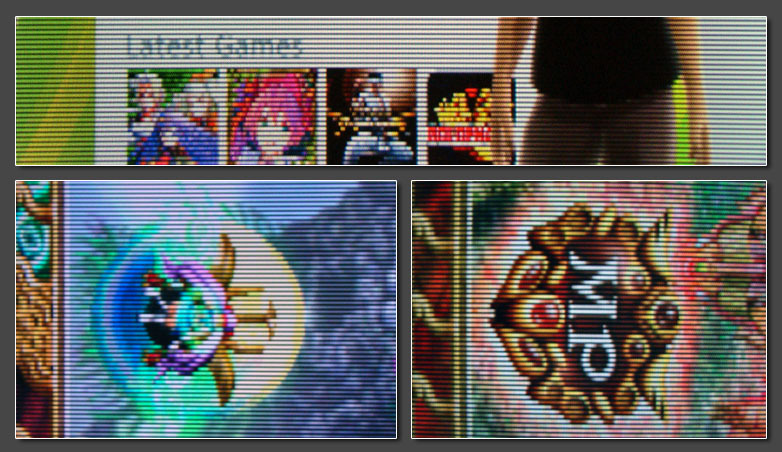 Sync polarity isn't a problem and the scanlines are a perfect match for the linedoubled 480p output. The Genius II on the other hand performs like a much more modern machine. To be on the safe side I first connected a composite video source (a NTSC Super Famicom) and used the HDMI output to connect the upscaler to my display. The Genius II features a little LED display showing a number between 0 and 7 corresponding to the eight available output resolutions. 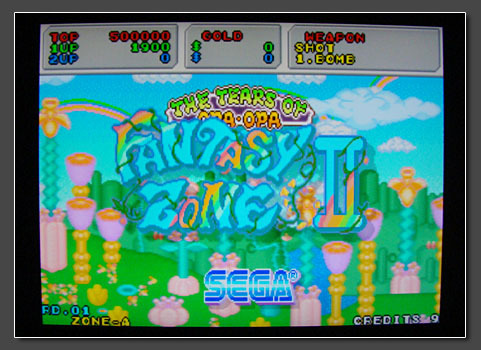 Unfortunately not all resolutions were compatible with my Sony LCD, but at least XGA and 720p worked fine. No surprise here, but the NTSC composite signal looked crazy bad. Terrible comb filter quality with lots of artefacts and rainbows, but at least the linedoubling was again flawless. I first switched to the VGA output and as expected all the VESA timings worked fine on my setup. I then replaced the composite source with a proper RGB source and things started to shine. Contrary to the complicated setup on the original Genius, I was easily able to get a picture from all my RGB source running through a Sync Strike first and then directly into the Genius II using C-Sync. No RGB interfaces neccessary. The Genius II has an enforced auto adjust function which (successfully) tries to scale the active source to fullscreen. 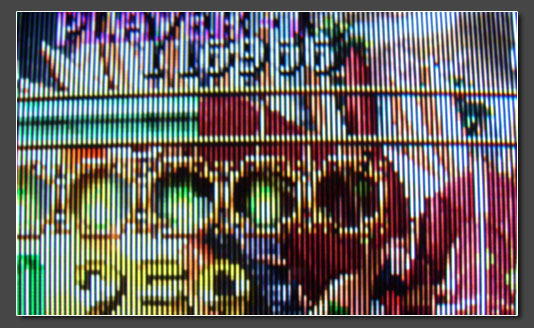 This is nice if one wants to get rid of the over/underscan borders, but it kinds ruins the perfect 1:2 linedoubling using straight VGA out (480p) and if one tried to overlay scanlines, they'll be misaligned, since most videogame systems run at resolutions around 224p (with Playstation 1 being one of the very few real 240p sources). Nevertheless using higher output resolutions like XGA brought a nice, colorful and especially smooth picture with no instability problems whatsoever. Quite nice. Again no unneccessary deinterlacing is applied. The OSD and menu on the Genius II is kinda hard to use. Again you can try to counter the auto adjust function, but once you turn of your source or the MIMO your settings will be gone and you won't adjust those settings twice. I also ran into a little bug using the menu: when reaching the last entry (OSD position) the MIMO got unresponsive and I had to power cycle to get back into action. Conclusion (for upscaler use): The original Genius is an outdated and hard to use upscaler, while the Genius II works quite nice, but brings nothing to the table what other processors don't. At the price you can easily get one of the older XRGB machines instead. But to be honest - my only reason for reviewing the MIMO units was to see how they perform with downscaling - so let's have a look at this neat function next! In the second part of this review, I'll focus on the downscaling capabitilities of the Genius boxes. Without repeating myself, just a short intro why downscaling is interesting: If you have a classic RGB tube (monitor, TV, arcade cab) at home and you want to connect a modern system like a MAME PC, a XBox360 or a Dreamcast you can usually do this by using a 15khz 480i RGB signal. This works, but causes problems like flickering graphics and doesn't show proper scanlines. On a PC you would also need an ArcadeVGA card to do so and not everyone likes to build custom PC setups. By using an external scan converter you can downconvert any VGA signal to a 15khz RGB signal. All of the scan converters sold today offer 480i output only (no 240p). The only two converters to offer real 240p output were some of Extrons Emotia units (out of production for more than 10 years now) and the Ultracade UVC (out of production since 2008 and now completely sold out). Although more expensive than a 2nd hand Emotia or a UVC, the Genius boxes promised to fill this gap and I'll have a look at how they perform. For my testrun I will have two targets. 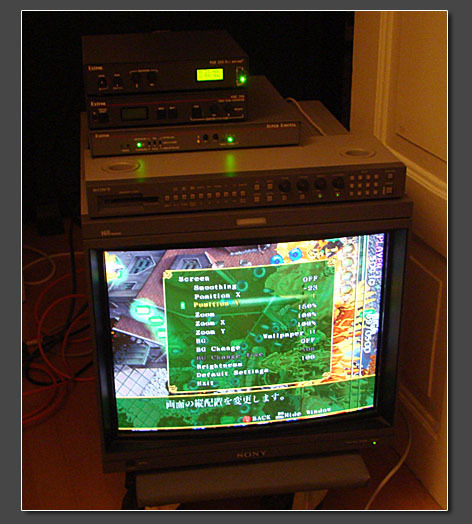 First a Sony BVM RGB monitor and second a XRGB-Mini upscaler. Both are always happy to receive real 240p material, so it will be easy to see if the Genius's output meets that promise. My source will be a XBox360 with titles like Futari, ESPGaluda II or Deathsmiles. Those run in native 480p and have to look 100% like the PCB once downscaled. The XBox360 is connected through VGA. I have an Emotia on hand to do a 1:1 comparison of the quality. Compared to the upscaler part of the review, this time it's easy to connect the source, since both the Genius and the Genius II have standard VGA inputs. On the output side I'll use my AMP Modu-1 to VGA adapter. I expect both Genius boxes to output seperate sync signals (H+V), so I have a bunch of interfaces ready to combine those sync signals back into composite sync for use on the Sony display and Micomsoft machine. The Benchmark to meet is an Emotia setup tweaked using an Extron interface with vertical shift function (see the two pics above). If set to 240p output, the Emotia will average two adjacent lines of the 480p source signal into one line. On a direct feed the Emotia begins with line 2 and merges it with line 3. The result will be a nice looking progressive 240p signal, but it will not offer perfect sharpness and won't look 100% like the PCB. For perfect results, the incoming signal has to shifted by one line (up or down). Some games (like Cave's XBox360 titles) have internal controls to do this and so does MAME. Overall it's still easier to use an Extron interface to do this. The following two screenshots show the difference. Standard alignment on the left, tweaked alignment on the right (easy to see on the big "1" on the top left, which is originally three pixels high, but spread over four lines without the alignment adjustment). The UVC performs just like the Emotia. This might be nitpicking, but if I hear people complain that an Emotia does not deliver *perfect* results from any MAME setup - this is the reason. First up was the original Genius box. XBox360 connected to the VGA input. The RGB output connected to the monitor (through a sync combiner interface). Unfortunately I didn't get any usable results. I checked the connections and cycled through the Genius's output options. I made sure the LED next to "15khz output" was lit, but again, no picture. I then connected the output of the Genius to a more advanced RGB interface and interestingly, it showed me that the output signal was around 30khz instead of 15khz. So, for the moment, no Genius 1 downscaling results. Fellow shmups.com board member Capoz had more luck with his unit, so I'm positive that I either did something wrong (unlikely) or the unit I have on hand is flaky. 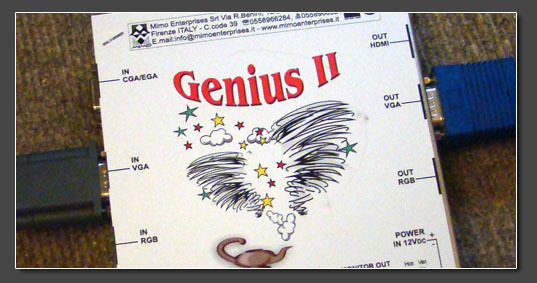 Next up was the Genius II box. It already performed much better on the upscaling testrun, so goods things are be expected. Again, 360 connected to the VGA input. Genius II output running through a sync combiner into the Sony BVM. Before powering up the Sony, I set the Genius II to output resolution #0, which - according the the manual - should be a 15khz 240p timing. One extremely positive thing I found right away is that the VGA output can be used instead of the Modu-1 connector. Both outputs deliver the same signal (at least in #0 mode). Of course the VGA connector is much easier to use for a wider range of available cables. Conclusion (for downscaler use): Unfortunately I was not able run the test on the Genius I - maybe it was my setup, maybe it was the unit. The Genius II performs *stunningly* with downscaling. The 240p output in RGBHV format looks fantastic and there are no problems whatsoever with the image alignment. The Genius II is just up there with the Extron Emotia and Ultracade UVC units, surpassing them both in the ease to use and equalling them in pure picture quality. 250 EUR isn't cheap, but the Genius II is a very versatile machine and if you already spend muliples of that on your candy cab, don't hesitate to place an order in Italy! **Highly recommended for downscaling purposes** !! I was not able to test the 24khz output on the Genius II, but I have no doubts that it looks at least as good as the UVC's 24khz output.